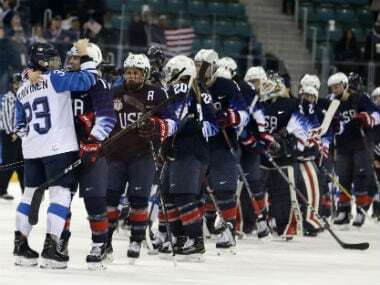 Gangneung, South Korea: Reigning world champion US blanked Finland 5-0 on Monday to reach the Pyeongchang Olympic women's hockey final, where long-time nemesis and four-time defending champion Canada could await. Dani Cameranesi scored two goals and US goaltender Maddie Rooney made 14 saves as the Americans, who haven't won Olympic gold in 20 years, booked a berth in Thursday's championship game. "It's honestly a dream come true," US forward Hilary Knight said. "It's the world's biggest stage. It's the game you've been dreaming of. You have to keep working and do the things you do well." 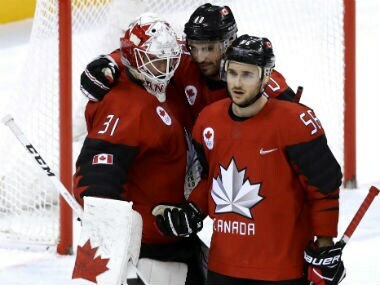 The Canadians take a 23-game Olympic win streak into a later semi-final against the Olympic Athletes from Russia. 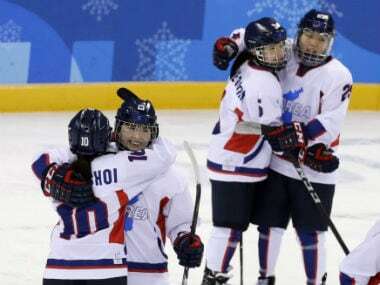 They edged the US women in over-time for 2014 Olympic gold but have lost the past three world finals to the Americans. "We're confident. We'll stick with what has gotten us success the last three years," US forward Jocelyne Lamoureux-Davidson said. "We'll enjoy this. It's what we came here and worked hard for, to put ourselves in position for a gold medal." Knight, Lamoureux-Davidson and Gigi Martin also scored for the US women, who dominated Finland from the start. "We played very well. It's spectacular to see our team come out and perform that well because there was a lot of pressure," said US coach Robb Stauber. "This was really a gold medal preparation for us. We had to be ready to play. We'll evaluate what we see in film to see what we can get better at. "We're in the gold medal game. That's the most important thing." One item of concern for the Americans was the hard hit US captain Meghan Duggan inflicted on Finland's Ronja Savolainen, sending her face-first into the boards. The Finn was slow to rise from the blow but helped off the ice. "I'm OK. My head just got hit on the boards. But I'm good," Savolainen said. "I was taking so long my feet were pretty cold. It was a little strong because it was a hard hit." Duggan said she didn't expect an issue regarding a possible ban for the final. "I don't think so. That's out of our control," Duggan said. "There wasn't a call on the ice. We kept going." The Americans, who have not won Olympic gold since the first women's tournament in 1998 at Nagano, outshot Canada 45-23 in a group stage meeting last week but lost 2-1. "We had a lot of point-blank scoring opportunities. 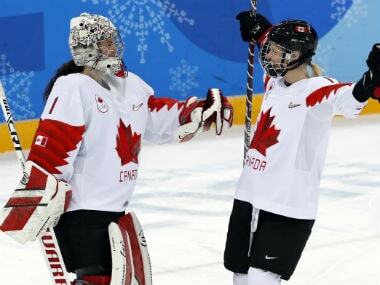 We've got to find a way to get those in the net," Lamoureux-Davidson said. "When you put 45 shots on goal you've got to be able to put more than one into the net. We've been focused on what we have to do — we just have to find a way to finish."